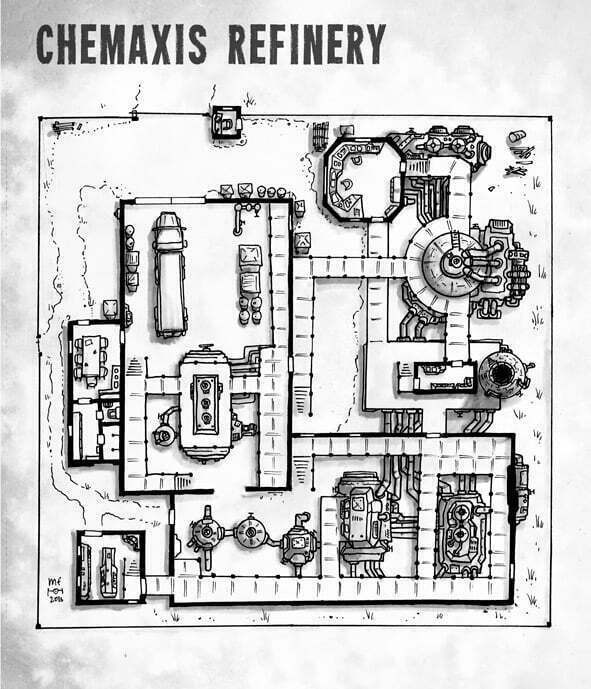 Why are there so few factory or industrial plant maps around, yet many modern and scifi RPG campaigns end up visiting one at some point? Well, I think one of my patrons on Patreon had faced the same question and as a part of his patron reward asked me to do a factory map with multiple overpassing levels, walkways and such. Well, I actually used to work for a summer in a fertilizer factory when I was 18, and drew some inspiration from that. It’s not possible to fit a big detailed factory on one page, so I did a smaller facility that could well work as a small power plant or chemical refinery. I hope you like the map and have use for it.